Romualdo proposes to Hadrian, king of Tuan, that a big celebration for peace be held in which all the weapons of both kingdoms will be destroyed. The news is received with great satisfaction in all corners of the kingdom. 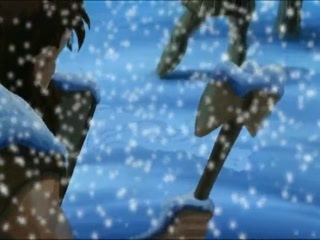 Only Daniel Hammer, the ironsmith of Tuan, receives the news with anger because it means the end of his work.Out of desperation, Hammer makes a pact with the diabolical Darken that will enable him to save his weapons from being destroyed and to fight against the person who wants them destroyed: young Romualdo. Darken gives Hammer special powers and brings to life his most highly esteemed weapons, which are thus transformed into an improvised army of dangerous living objects.Romualdo confesses to Fantaghiro the excitement with which he awaits that instant when all of the weapons in the kingdom will finally disappear. From the day he saw his father die as the result of a battle injury, Romualdo experiences terrible nightmares in which he is chased by all types of weapons that try to kill him, just as happened to his father.With the arrival of Hammer, Romualdo will watch in surprise how his nightmares turn into reality, putting his life and the life of his friends into serious danger. The entire castle of Tuan is invaded by a horde of living weapons that have been ordered to seek out the young king and hand him over to the fearsome Hammer who plans to take revenge.